Matchbox Best of the World Hawl! I remembered seeing these teased over on Lamley, but immediately gave up on ever finding them. Last night I stopped at the store on a whim, and I am glad I did. Matchbox coolness abounds! These things are beyond rad. This bus reminds me of one I had as a kid. Mine was the traditional red, but this one is amazing in gold! It’s way outside my traditional collecting habits, but I had to grab it. Next up is this Mini Van. The purple and white checkered roof pushes my buttons. In a good way. Third, we have a Land Rover Defender with ambulance deco. Once again, kind of outside my norm, but too fun to pass up. There’s something shaped like a chainsaw molded into the roof rack plastic, which I can’t get a picture of. Strikes me as useful ambulance equipment. Last, but certainly not least, the BMW 1M. The others are very good, but this is some next-level stuff. The “BestOTW” license plate script, front and back, is well-placed; as is the two-tone gloss and matte black paint (hopefully my iPotato picks it up okay). I am really blown away by this car! 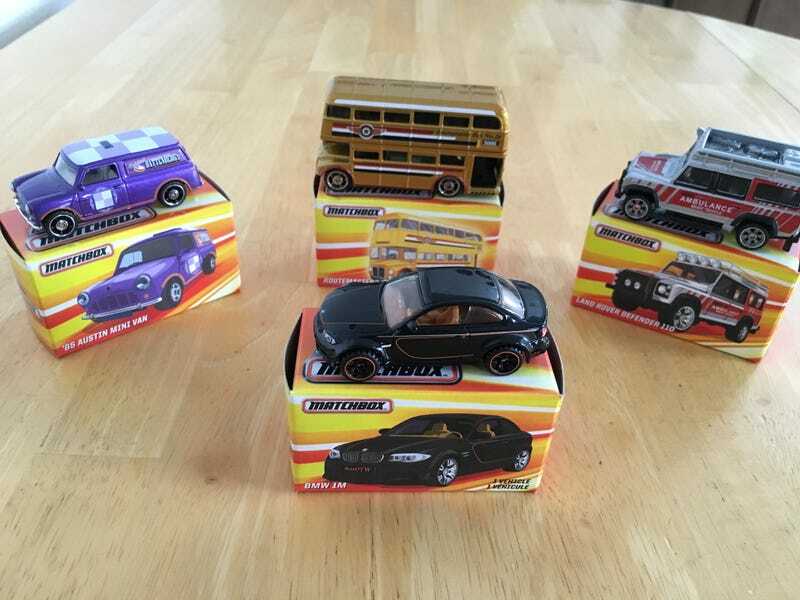 I’m just becoming acquainted with Matchbox as a collector, but I am really happy with these. The wheels are not rubber (EDIT: they totally are rubber, durr), but roll across hard surfaces quietly, almost like Real Riders. I know these are a premium wheel, but I would love to see them on more MBX cars. Anyway, one more thing to show you. Land Cruiser! With awesome 70's paint and stripes! I thought they had changed the casting and made the front fenders plastic...? Maybe they did and I just got lucky. Whatever the case, this is a great casting. Weighty, even with the plastic base, and that paint job is thoroughly good. I gotta say, it was a good day. Thanks for reading!